After a year in the sidelines, developing markets are set to take centre stage in 2019. With the Federal Reserve raising interest rates, many strategists are turning their attention to other markets. Proof of this comes in the results of a Bloomberg survey, which make a very compelling case to invest in emerging markets in 2019. The survey of 30 investors, traders and strategists carried out by Bloomberg at the tail end of 2018 couldn’t be more explicit: 2019 is the year to invest in emerging markets. Those in Latin America shine particularly bright with Brazil in full spotlight, topping the ratings for all three asset classes. According to Bloomberg, this year’s brightest star on the developing market horizon is Brazil. “The new year will usher a rebound in emerging market, with Brazil leading the charge,” says the summary of the survey. Bloomberg tip Brazil on the basis on the survey results for 2019. Among the 11 emerging market countries, Brazil stands in first place for all three asset classes. Latin America’s largest economy takes the top position for foreign exchange, bonds and stocks this year. Of the strategists surveyed, 77% believe that Brazilian foreign exchange is likely to rise in 2019. 90% expect an increase in Brazilian bonds and 73% forecast a rise in stocks. This alone makes a compelling case to invest in emerging markets this year, particularly Brazil. As Bloomberg says, “Forget the schnapps and grab a caipirinha”. As well as Brazil taking centre stage for all three asset classes, Mexico too has strong potential in 2019. As a result, the two giants mean that Latin American looks good on the investment scene this year. 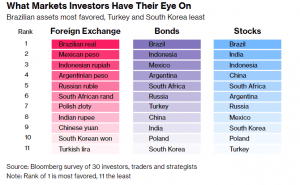 In the regional classification, Latin America takes top place in the Bloomberg survey for both foreign exchange and bonds. In the forecast for stocks performance, the region sits in second place. The powerhouse behind Latin America is, however, more likely to be Brazil than Mexico. The survey revealed that 66% of analysts believe Brazilian economic growth will be faster this year than anticipated. This is the highest figure among the 11-country survey. The main reasons behind the analysts’ tips to invest in emerging markets this year are two-fold. The rise in interest rates in the US means developing countries that have borrowed in dollars will get relief this year. Ever-higher borrowing rates also mean that funds will be looking for alternative markets. Factors to look at in 2019 when you invest in emerging markets, according to the survey, include the Federal Reserve, the analysts’ top consideration. As well as movements in US interest rates, they believe the trade war between the US and China will be the second most important factor, followed by the global economy.